Surya Namaskar or sun salutation is best Yoga. Sun is the life source of all matter. Suryanamaskar implies to bow down to the sun and create synchronization in mental & spiritual health. It is done early morning at 5 am to absorb vitamin D from early sunrays. The yogic exercise has twelve postures which provide stimulation as well relaxation to all body organs. Sun Salutation has numerous benefits which can be studied on different dimensions. Benefits of Surya Namaskar- How to do Surya namaskar? Surya namaskar (Sun Salutation) is a comprehensive yogic exercise which is beneficial to all organs of the body. Due to stretching and different postures, blood circulation is improved & all muscles in the body are toned.Regular practice of this exercise will keep you healthy & fit. Surya Namaskar is best practice in Yoga, It is often the beginning vinyasa within a longer yoga series. Surya namaskara is a very effective full body workout which will fasten your fat loss. Belly fat can be easily decreased by practicing it daily. Surya namaskar is very helpful to cure irregularities in menstrual cycle of women. It improves the blood circulation and make muscles flexible, which reduces the pain as well as disbalance in monthly periods. Surya namaskar regulates the mental & spiritual health of human beings. Chanting mantras along with the yogic postures in early morning provides mental peace as well spiritual well being.This will keep your mind calm all daylong & increase alertness. 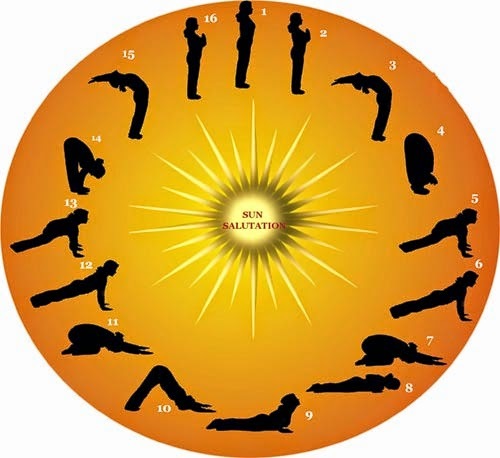 Surya namaskar is helpful in various diseases also like blood pressure as well insomnia. Due to increased blood circulation in brain, oxygen is supplied to all areas in brain; hence it is useful for asthma patients.It is beneficial in curing insomnia and hypertension also. Surya namaskar is also a breathing exercise, in which synchronization of breathing and physical moments are there. Due to expansion & contraction of heart muscles blood circulation in heart is improved. It is a great cardiovascular workout. Practicing Surya namaskar will bring a social transformation in your lives. People become more empathetic & alert to emotions of other people. This will help make more friends & increase your influence in society, which will lead to a happy life. Making Surya namaskar as a part of your life will not only provide you physical health but also mental & spiritual health. It will impact on every aspect of your life positively & you will progress towards a healthy lifestyle. Surya Namaskara, like most asanas, is recommended to be performed on an empty stomach. Therefore some recommend a gap of at least two hours after eating and before performing the namaskara. It is generally practiced in the morning before breakfast or in evening.